Calvin Coolidge: The "Say-Nothing" President. On August 2, 1923, Calvin Coolidge was vacationing at his father's home at Plymouth, Vermont when he was awakened by the tragic news of Warren Harding's death. Harding, had been on a public speaking tour of the West, when his health began to deteriorate, he tried to alleviate the scandal that have been plaguing his presidency. Praying by candlelight, Coolidge descended the stairs to the living room of his father's house, where he lit two lamps. Upon an old wooden business desk, a copy of the US Constitution was found and Coolidge took the oath of office, as his father administered him as the next president of the United States on the family Bible. 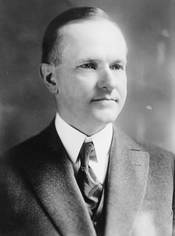 In his six years as president of the United States, Calvin Coolidge was considered to be a heroic president not for what he did, but for what he did not do. Walter Lippmann, a White House Advisor for Coolidge in 1926 pointed out: "his talent for effectively doing nothing. This active inactivity suits the mood and certain needs of the country admirably. It suits all the business interests which wants to be let alone... and it suits all those who have become convinced that government in this country has become dangerously complicated and top heavy". It is no wonder, that Coolidge was known as the "do-nothing" president. WriteWork contributors. "Calvin Coolidge: The "Say-Nothing" President." WriteWork.com. WriteWork.com, 15 February, 2006. Web. 23 Apr. 2019.